Also known as a stone fruit because of their solid pits, plums are a juicy, flavorful fruit mostly enjoyed through the summer and fall months. 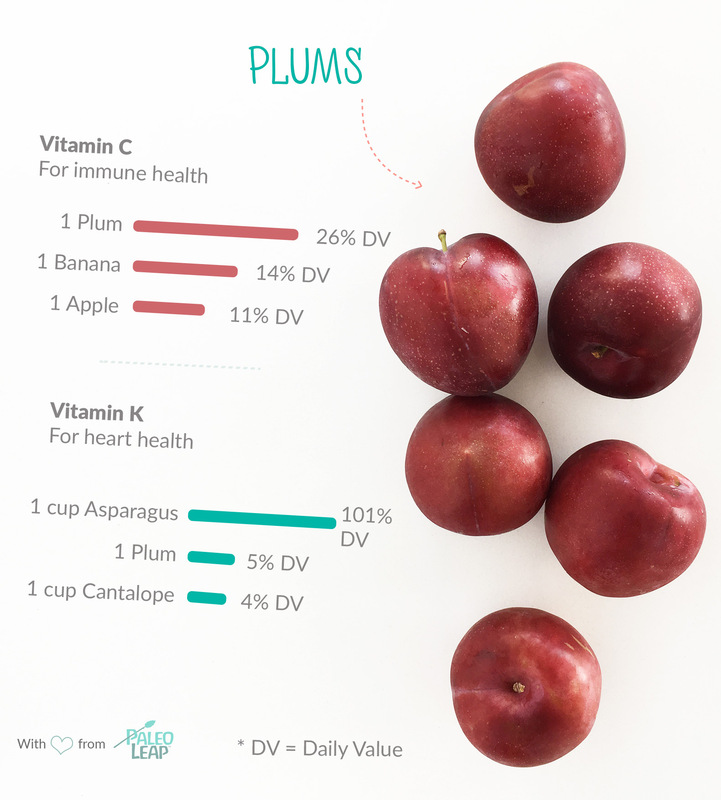 Plums come in many varieties – some sweet and some tart – yet all plums provide a good dose of Vitamin C.
Orange dots show how 1 cup of plums fit into the typical nutrient profile of a Paleo meal. Look for plums that are firm, yet have a slight amount of give when squeezed. VARIETIES: There are over 200 varieties of plums. Colors can range from a dark purple-black to a light yellow-orange. Flavors vary from very sweet to tart. DRIED: Dried plums are called prunes. Most prunes are made from a specific variety of European plum. Dried fruit can contain a large amount of sugar, prunes included. SEASON: Plums can be found in stores and markets from May through the fall season. Slice a plum along its natural indentation line, twist the halves and pluck out the pit. Enjoy alone or diced up in a fruit salad. Dice plums, simmer down and use as a filling in a nut flour-based crumble or pie. Slice in half, grill flesh side down for 15-20 minutes and serve hot off the grill. Drizzle with honey or maple syrup, if desired. Boil down diced plums and create a sweet jam or a savory sauce to drizzle over chicken or pork.